This is kind of a big deal…the BBC have just about the toughest demands for what they will accept for 100% programme acquisition for an HD show. When the 5DmkII was first tested by the BBC it was dismissed straight away due to it’s moire/ aliasing issues and like any format that doesn’t qualify for them it is limited to just 25% of the programme. “Obviously the BBC were very unwilling to sign off on something like that because it wasn’t on their approved list and initially they were saying that for an HD programme they could only support 25% of the programme shot on a non ‘so called’ HD camera. “We shot a lot of tests which looked wonderful but the engineers at the BBC were saying that there was aliasing and moiré patterns that would make them fail the use of the camera for HD broadcast. “However we’d done a lot of independent research and shot more tests and shown them to people. When the tests came back from the BBC they said there was aliasing but they suggested that we shoot more tests in a type of scenario that the production would encounter, like a scene with actors looking backwards and forwards with mid-shots and close ups. Honestly this is such a big turning point as I know so many people who have been struggling to get the BBC to say yes even for SD projects. EDIT: With the slight backtrack it changes this blog a little, but it really should be on a case by case basis anyway. What we do not want is everyone shooting everything on these cameras as we all know they are not perfect and there are certain things which are clearly not the best use of DSLRs…but it’s great that we are seeing more and more stuff..the funny thing is I can’t watch BBC HD at home on my Sky HD Box. It looks so awful, artefacts galore and hideous over sharpening that I just wait for the blu-rays! Also shot on 7&5d, also on BBC 2 Saturday afternoons, in it’s second series urban music show No Hats No Trainers. Twice pick of the day in the Guardian Guide…. It seems youth programing is leading the way. Just caught this episode – looked great. Didn’t see any moire or anti aliasing standing out. I can only imagine with more time on a fully funded (!) drama the Canons could really shine more. Thats amazing, I know just how stubborn the beeb can be having worked in the visual effects department, it can sometimes be a bit Institutionalised (as can many places) Great to see some moves into this area. BBC usually creates “white papers” for each technology it tests,and puts them out in public.It would be interesting to read that if/when it comes out. they didn’t do one as it failed right at the start when they tested it! Great news – let’s hope the Beeb establish some guidelines that make sense ie preferred workflows etc. What is interesting is the comments in the article regarding picture quality and the acceptance that all acquisition formats have issues associated with them (finally – sense prevails!). The truth is, in my view, House did a lot to prove a point – but we needed a home-grown project to go through the BBC so the quality of the final image/look/style etc could be seen in the context of a program they’d commissioned – rather than something made elsewhere (ie they evaluated test materials and rushes on a day to day basis – something they would not have done with a bought-in drama or program). Anyway, as you say, this is big news – glad you’ve made a separate post on this, it’s a great next step and is something of a barrier that’s been removed in terms of UK production. Now it’ll be interesting to see what C4 do – as I suspect the last series of ‘Jamie Does’ was shot with some DSLR input – certainly the first ‘Marrakesh’ episode had a very Canonesque flavour. That’s interesting and not surprising really. I presume it doesn’t change the overall BBC position on the camera – you can’t just go off and use it for commissioned HD programming, but they are willing to work on a case-by-case basis. In the same way that ‘Deadliest Catch’ can be “HD” for Discovery despite being shot on HDV. ..which is why it needs to be handled case-by-case – without understanding the issues, it can be pretty easy to be strung by the limitations. Every time i try to join your website though twitter or word press it just give me an error. I’ve tried several browsers as well as 2 different PC’s on different IP addresses. Starting to think its a site issue. Anywho BBC is amazing I wish I could work there someday as a Post Production editor. Yay! More shows using DSLRs! Hi Philip Bloom. I just got my t2i, and I’m looking for a 50mm prime lens. I’m not sure if I should get a Canon EF 50mm 1.8, or a vintage Nikkor-S Pre Ai 50mm 1.4 with an adapter. They’re priced about the same. I hope you can help! Thanks! At very reasonable price you can buy a Carl Zeiss 50mm f1.4 Contax/Yashica, in second hand market, with a simple adapter. Great quality for the price. Awesome. An article or info on 5D MK2 moire and aliasing issues and how to avoid and or work around them etc would be great. I watched the first episode of Digging for Britain and some scenes looked 5Dish. So they can use anything as long as it’s under 25%? A great day for DSLR owners!!! Finally, the Beeb are using their noggins and their eyes! In the UK everybody with a TV pays a licence fee, which pays for the BBC. Making programmes with more affordable cameras, where possible is just good business and of course, DSLRs open up new opportunities for the new breed of cameramen and women. I’m thrilled. Great story Phil. Hey Phil, check out this link to some test shots I did in March for a very famous British soap and see how great it could look..! This is great news Phil, it legitimizes things to those who need legitimizing! I have this question. What is the best workflow to deliver SD (interlaced) footage, shot with a 5DmkII ? Some of my BBC work done with the 7d. Thanks. Looks similar to Euronews… I wouldn have thought it was filmed with the 7D while watching it on TV. I work for the Beeb (World Service) too (Hi Phil how goes it 🙂 and have been using the 7D for the last 6 months making films for the web and internal corporate promos. Everyone here who sees the images are totally blown away and rather shocked that they come out of such a small camera. It’s great to see that there are some engineers who are now putting the audience first instead of their own way of doing things. This is a huge turnaround from the Beeb. I was at a tapeless workflow seminar in Bristol only four weeks ago and Sky were there talking about ‘An Idiot Abroad’ (new show featuring Karl Pilkington). They basically said that as long as the Beeb didn’t allow lower than 50Mb/s HD, neither would they or a lot of other broadcasters. They had some lovely footage from a 7D but couldn’t use a lot of it due to the 25% rule. With this announcement, expect the floodgates to open! This article should probably tone down the enthusiasm a little. 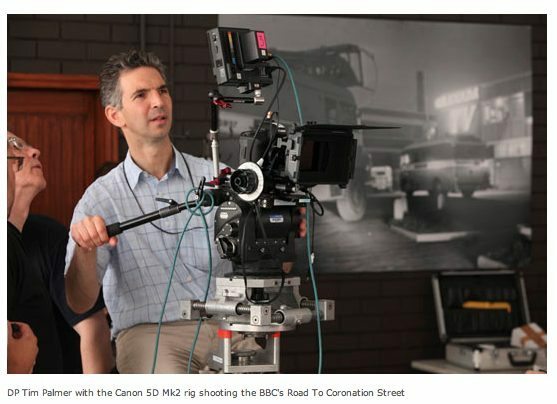 I know they have already used these cameras as crash-cams/extra angles on one big BBC Drama – but they are not on the approval list yet. They are looking at them on a case by case basis – as the article states. This one gives more detail, same site. That the BBC is now accepting 5D2 footage is IMO another sign of the “cheapenning” that has taken place everywhere after the economic crisis. Budgets have been cut by as much as a fifth, staffs have been halved, but managers still expect the same final results as before. We’re now through a “good enough” period in all sort of business, because people apparently don’t care about quality anymore, only about the price, be it food, TV, Music, Cars, whatever. So it’s all about saving as many pennies as possible. Do you know how much TV networks pay now for 1 hr of content? It’s simply absurd. BTW, that the BBC accepts 5D2 footage doesn’t mean that its issues have magically dissapeared. They’re still there. 5D2’s video was an afterthought. But in months we’ll see the PROPER cams (DSLRs/Videocams) from all manufacturers, Canon included, with the good FF/APS-C sensors, SDI-out, better codecs, no artifacts, audio sync, etc. I hope the BBC favours those instead, after this “1.0 DSLR-video crazyness”. The BBC’s HD standards are a joke anyway. By the time it reaches my telly it’s compressed to buggery and 720p! The talk about anti aliasing and moire is laughable in that respect. congrats on your 5D2 accomplishment. I have to disagree on your “first show” claim, though. I shot a full show in May and another one in July for air on a global HD network, Al Jazeera English. Either way, I love the format. Doh! It’s on hold. It seems traces of enthusiasm could be detected, so emergency backtracking measures have now been implemented. …dull and highly qualified news as it happens. Why do all the people talking about 5DmkII and 7D every time?. Why s the 550D (upcoming 60D also)? Cant we use 550D/T2i or any same level cameras for this level of productions? (expecting Camera’s build quality). is 550D or same level cams suitable for that? Anyone reply me please, because i like to learn that . .
I’m saying like that in my knowledge(as a student level), 5D mk2 , 7D, 550D are all cams produce same video quality in HD modes. thats why i asked like that . .
i need your help to solve my simple problem. thank you . . I configured the rigs for RGB and chose to use the Nikon AIS lenses, those old nikkors need much more much torque to turn them so they show up any mechanical weakness in the rig. The reason we did not use canon lenses was the lack of hard end stops make it impossible to reliably pull focus, even the Arri MFF-1 needs its hard stops to be reset for each lens and chroziel VariLock dose not have enoungh movment to be get the whole foucus range. There are are a wider range AIS nikkors available than the ziess ZE/ZF lenses and Grayham Playford has experience of modifying these lenses and is London based. Lens choice decided we could use a standard chroziel Video Single follow focus ( like the Arri MFF-1 the lock for the bars is separate to the focus gear positioning lock which makes drive gear positioning accurate and lens changes faster ). We also modified the zacuto base plate dumping the manfrotto quick release as it introduced movement due to its rubber grip. I talked with Tim during testing for this project, the aliasing and moiré on brick work and roofs in the street scenes that worried the beeb were also there on the Sony 750 tests just not as bad, a lot of this also stems from having to do HD progressive to SD interlaced down converts that can make these artefacts worse. One problem here is that the pass/fail is dependant on the QV machine and subject you can get conflicting results and the guys who have to do these test tend to play it safe. I don’t believe BBC or any other broadcaster to be intentionally resistant to the use DSLR footage for broadcast it has much to do new formats being incompatible with antiquated infrastructure and out dated standards and practices. This is a very good sign and I expect DIGIC 5 will solve aliasing & moire, giving us a cleanly downscaled image from the full sensor. I don’t expect it in the 1DS Mark 4 at Photokina though. I expect the 5D Mark 3’s sensor to debut in the 1DS then the 5D will feature DIGIC 5 in 1 years time. That’s how it happened last time. That is a sweet looking rig that Tim has BTW. PS – Philip your Twit Connect isn’t working. I am a Twit and I can’t connect! Anyone know what monitor they are using in the above picture? And what is that beast of a tripod set up? Philip – was great seeing you at the Canon expo – sorry we didn’t end up chatting much. I think I spotted what looked to be some 5Dmk2 footage on the BBC’s ‘Culture Show’ Edinburgh Festival specials. It was for some night time shots – and very nice they looked too. Cheapening? Have you seen how much a DSLR kit with prime lens, follow focus and rig costs to hire recently? Or the post production costs in converting the footage and of having a tape-less workflow? If anything its comparable (if not more expensive) to an HD camera but with much better results. DSLRS are not the MP3 of video, they are higher quality than most of the junk produced with current Sony SD cameras, Z1,Z5, Z7s, EX1s that the BBC and other mainstream broadcasters have been using for the last decade. Cameras that were never fit for purpose in the first place. DSLRS are rightfully permeating throughout the industry because for once an affordable, high quality camera has been released into a market dominated for too long by sub-standard, over-priced and poor quality Sony cameras. The “issues” of moire, noise, work-flow etc are just as prevalent with most HD cameras, but because they fit with current channel guidelines are somehow acceptable? I’ve shot two camera interviews with the 7D and Sony XdcamHD PDW-700 back in November and was shocked at the difference in quality, with the quite frankly poor Canon 16-135mm kit lens the image was better quality, clearer and with far less noise than the Xdcam, a broadcast quality HD camera. Suffice to say it doesn’t get hired much anymore! These cameras are the future and they work perfectly well with minor modifications in the field now even in the harshest of conditions, and consistently produce overwhelmingly high quality work. When was the last time someone uploaded a clip shot on the Z1 to show off how good it looked. Never, and there’s a reason for that. With any new technology there’s a hesitance at first, but the realities of shooting DSLR for video are that it is infinitely better than all but the most expensive alternatives for ANY work, especially broadcast. I’ve been using it exclusively for nearly a year now for everything I do, broadcast, corporate, documentary, drama, live-events and it’s never let me down. Well done the BBC for seeing sense and producing something using the latest technology, and embracing the beginning of the most important revolution in film-making since colour film was introduced. Can I just add the DSLR’s have NOT been given the green light for HD use. At the moment it is a programme by programme decision. I will be running some full tests on the cameras and post routes soon but so far the alias issues (camera sensor) and the codec are a cause for concern. No programme using a DSLR (of any make or model) will be treated as full HD until the programme has demonstrated it meets the required standards for HD and SD transmission. It started with the Z1s and the trend continues with DSLRs. Those pieces of equipment have always been pushed in the name of budget cutting, not because they were better than what already was on the market. Whether it’s a TV Ad, a Docu or a Drama, the cost of whatever camera is used is a ridiculous fraction, overall production budgets considered. In the end, it really makes no difference in terms of costs if you shoot the commercial with a 5D2 or an ARRI D21, but by using a DSLR instead (with all the troubles it brings compared to a proper camera) you’re sending the wrong message to the managers/producers, which now think they must cheap out and pay nothing. On the other hand, there’s the risk of the entire industry going to hell as has happened with the music and recording business. Due to cheaper technologies almost all legendary recording studios have closed in the last decade and there’s now 100 times more production than before, while demand has not only not augmented but has actually decreased susbtantially. This has brought budgets to the floor and the industry has been killed. All that’s left is MySpace for amateurs. We’re now facing the same with DLSRs. Students/Newcomers willing to take entire production jobs for as low as €3k (while they used to be well over 5 figures) undercutting experienced professionals with expensive equipment (which obviously superior results, not just technically) . And those students will be undercut themselves next year by other students with a 550D, as they’ll be willing to do it all for just €1k. I’d rather take the Varicam or an ALEXA and a proper production team, but that’s just me (BTW, I have several DLSRs, and am not a cameram but a producer+AD). God I hope not, What we really need still is a “form factor camera”, but small like a DSLR and loaded to the hilt with What we really need to shoot and produce the best quality work, all the bells and whistles. Am in hell on earth at the “Blueberry Festival” with six gazillion other people. Not a big crowd fan! 100% Dave T , Imagine when 16mm was first processed and shown that people decided it wasn’t acceptable for viewing movies etc… due to hair in the gate + gate weave etc… If your content is engaging and your footage is “good enough” technicalities like moire, softness , dynamic range etc go out the window. Really though – the amount of phone footage that gets put on the news / other shocking footage that goes to air… Not surprised it has been accepted on a case by case basis. Anyways Right now Broadcast TV has bigger problems than being picky about the quality of its footage! This is very encouraging news – things just seem to get better. I’m sure (or at least I hope) that there will be all kinds of plugins and work flow solutions coming out over the coming months that will enhance 5D footage even further. Thanks so much Philip for keeping your finger on the pulse and letting us know the latest. I have used 5D & 7D’s on multi-camera shoots.For Blu Ray release. La Roux same but with 5DMk2 in the pit……both Canons shat on the Sony’s. I eagerly look forward to viewing this programme on Thursday and notice that it is being broadcast simultaneously on the BBC HD Channel. I hope many of you read this in time. I’ll watch the HD version when it’s repeated on Saturday Night, but I did watch it on BBC Four and I have to say, Road To Coronation Street was one of the best dramas I have ever watched, it was a masterpiece and had me in tears. I just wish their was another episode. Absolutely awesome. Superbly filmed and casted. Never mind Eastenders Jessie Wallace could walk straight into Corrie now, and then i’d start watching it again. It was a drama showing how Coronation Street (originally named Florizel Street) got to first transmission, showing the casting of the characters, the initial rejection of the show and the battle to put it on air. Jessica Wallace was superb as Pat Phoenix, as was David Dawson as Tony Warren and Lynda Barron as Ena Sharples. James Roache also played his dad. It takes us upto the very first transmission. Getting absolutely rave reviews on the net, i’ve watched it twice and will watch again in HD. This was a seriously good production. Should win a BAFTA. all shot on the Canons? Based on the report 15% was shot on the HDW750, the 85% on the 5d. Is there a list anywhere of networks that have approved the format?